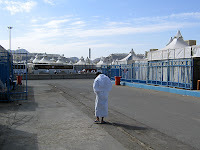 During the performing of Hajj in Mina to Arafa, Rosman and I didn't take any picture. So I had asked bro Yasin Chang for his pictures of the Mina Camp for Singapore. 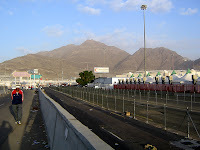 The Mina camps were divided according to contigents. Singapore is under south-east asia, camp number 76. 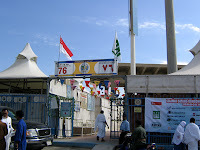 There were printed A4 papers pasted outside the tents, indicating the respective travel agencies. A hugh kitchen was located in every contigent's camp to provide meals for the pilgrims. All meals were provided by the Saudi. This year, the dimension of Mina had extended over the boarder of Mudzalifa... and Singapore camp was located in the "old" Mudzalifa, so we could still see the boarder's signage "Mudzalifa ends here" standing at the hill before our camp. We are back from the jounery.